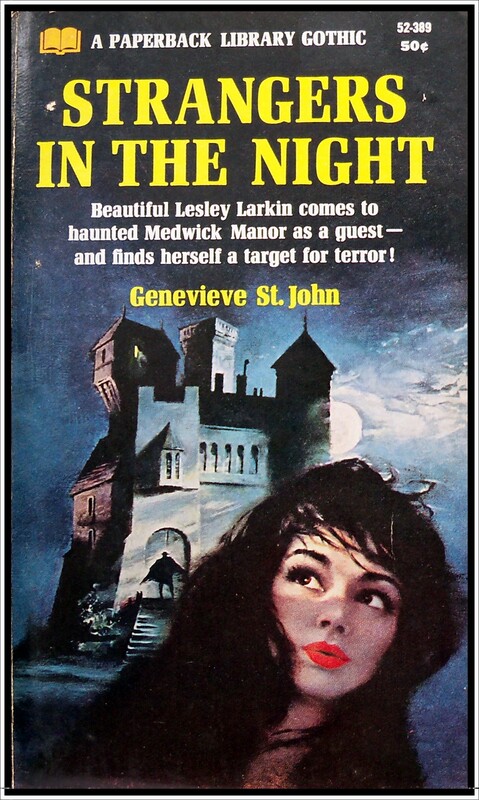 These nightmares haunt lovely Lesley Larkin at Medwick Manor! Lesley, a young lawyer, arrives at the old mansion with her client, Elsa Medwick, to handle the sale of the family home. Expecting to stay only a few days, she is suddenly trapped in a murderous web of sinister greed. Terror makes Medwick an accursed place. Surrounded by hostile strangers plotting her death, Lesley learns she can trust no one – not even her own client. Risking her life, Lesley struggles desperately to unravel the mystery of Medwick Manor before her own murder adds to its growing legend of evil. Written by Genevieve St. John. 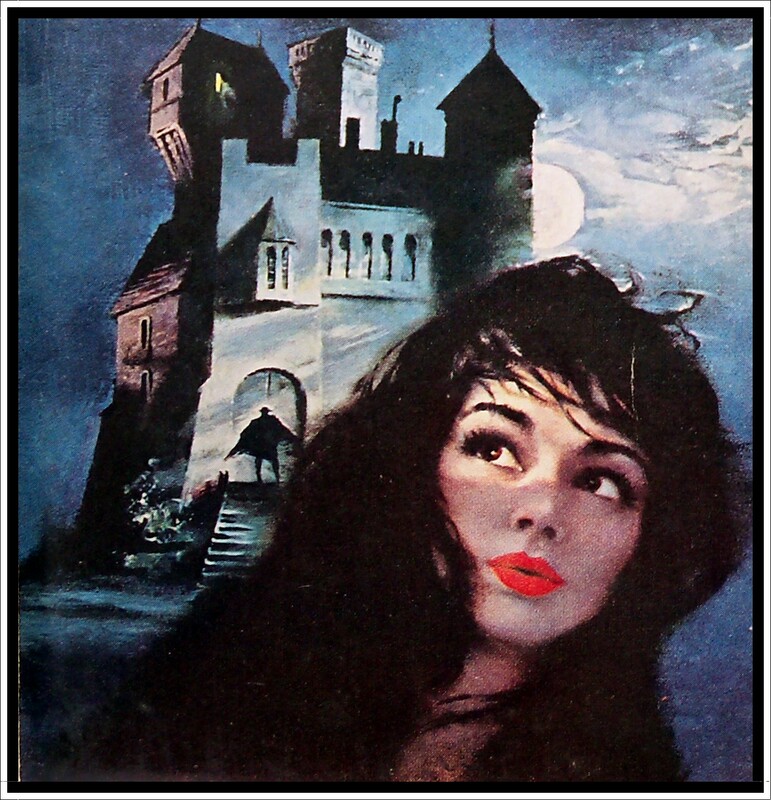 Paperback Library Edition first printing January 1967. Another fab Paperback Library cover to drool over. This has got to be one of the most fantastical houses ever conceived and makes non-Euclidean geometry look positively Bauhausian. Her lipstick is kind of gorgeous too. There is no signature for the artist unfortunately. I started reading this in the bath this morning. Our heroine, the young and lovely Lesley Larkin, has been working with a firm of fusty lawyers for over a year now and is getting a bit fed up of being stuck in their huge reference library, researching boring bits of legal minutiae for the senior partners. So when she is given the opportunity to help an important client sell their home she jumps at the chance. Her client is the glamorous Elsa Medwick and Lesley is to accompany her to the isolated Medwick Manor in order to assist with the negotiations. However, what starts off as a week out of the office, enjoying the luxury of a grand old mansion on the seacoast, is very quickly turning out to be the job from hell for Lesley. Her client, Elsa, is a spoilt risk-taker who is ‘not without some disturbing elements’. Then there is Medwick Manor itself – charmless, rundown and currently tenanted by Elsa’s childhood governess, a sinister woman with a strange hold over Elsa. And there is something very peculiar about Alan Crandall, the over-enthusiastic buyer who has just arrived with some unfeasibly heavy handbaggage. Ho Hum. Such are the perils of mixing business with pleasure and I have the feeling Lesley is in for an eventful week or two. So far Strangers in the Night is ticking all the right boxes – we have an isolated ‘architectural monstrosity’ of a setting peopled with characters all ready, willing and able to kill each other at the slightest provocation. I don’t know much about Genevieve St John but I have enjoyed her books before. Also, I wouldn’t be surprised if she has worked in the legal profession herself. Three out of five stars.